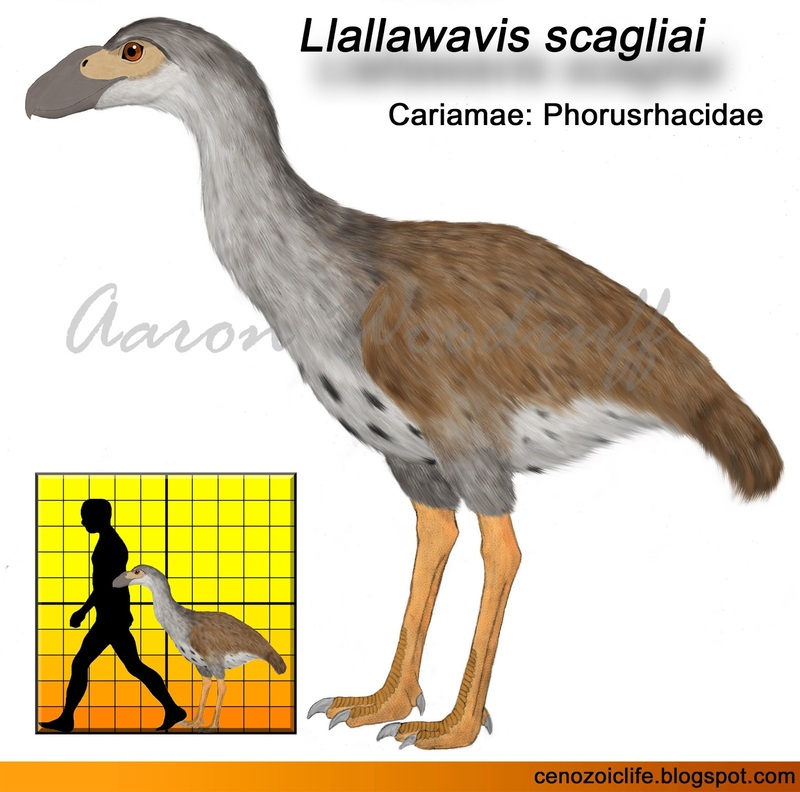 Scaglia’s Terror Bird (Llallawavis scagliai) is the most recently discovered member of the terror bird family (Phorusrhacidae). This species known for a single near-complete, fully-articulated skeleton which even includes a preserved windpipe. 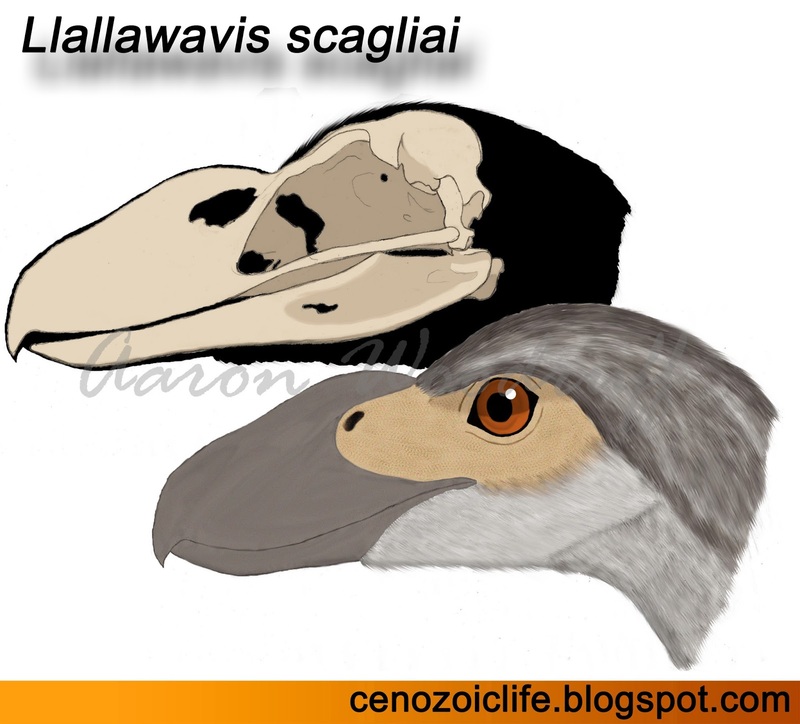 Drawing showing the skeletal anatomy of Llallawavis scagliai. Figure 2 from Degrange et al., 2015. The name Llallawa means “magnificent” in Quechua, in reference to the well-preserved nature of the remains. Avis is the Latin word for “bird”. The species name is after Galileo Juan Scalia, a naturalist and director of the Museo Municipal de Ciencias Naturales in Mar del Plata, Argentina. Fully translated, the binomial name therefore means “Scaglia’s Magnificent Bird”. Scaglia’s Terror Bird lived during the late Pliocene in what is now Argentina. Its habitat was likely grassland and open woodland. This species is known from a single, nearly complete articulated skeleton, the most complete of any terror bird known to date. Discovered in 2010 and described in 2015, the skeleton (shown above) was missing only some of the forelimb bones, toe bones, and the pygostyle*. This specimen is particularly valuable in that it includes the only complete trachea known for any terror bird, as well as intact sclerotic rings*. 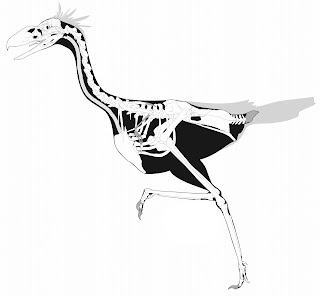 Scaglia’s Terror Bird was one of the smaller members of its family, with an estimated body mass of 18kg (40lbs) and a hip height of about 90cm (3ft). When fully erect, it could have stood 120cm (4ft) tall at the top of its head. The body was lightly-built with long, slender legs for fast running. The skull was about 27cm (0.9ft) long with a beak that was relatively shallower and with a less prominent hook than that of other terror birds. Another notable feature of the bird’s head was its narial knob or bump just above its nostrils. The structure of the inner ear suggests that Scaglia’s Terror Bird was adapted for very rapid and precise movements of the head and neck in response to visual and audio cues. Its low, narrow beak and lightweight body suggests that its diet consisted of relatively small prey items such as cavimorph rodents and other small mammals, as well as smaller birds and reptiles. It probably hunted in a manner similar to modern seriemas; after a short dash the prey would be pinned down before being picked up and violently slammed into the ground repeatedly. This action not only kills the victim, but also makes it easier to swallow due to the breaking of its bones. Although it is currently impossible to reproduce the types of sounds Scaglia’s Terror Bird could produce, detailed analysis of its hearing capacity has shown that it could detect frequencies ranging from 380 to 4230 Hz, with a mean sensitivity of 2300 Hz. The bird’s own vocalizations, as well as those of its prey would have fallen within this range. Pygostyle: in birds, the fusion of several caudal (tail) vertebrae into a single bone. Sclerotic ring: rings of interlocking bones which support the eyeball in several vertebrate groups.